INTRODUCTION Molluscum contagiosum is a common viral skin disease caused by a large intracytoplasmic DNA poxvirus that causes the epidermal cells to undergo decreased transit time. Infection usually arises from direct contact or fomites in children, and by sexually transmitted routes in young adults. The incubation period is usually about two weeks. Specific antibodies are present in 87% of affected patients by immunofluorescence. CLINICAL PRESENTATION The characteristic molluscum lesion appears as a raised, smooth, shiny, dome-shaped, white-to-pink nodule 1 to 5 mm in diameter with a central umbilication filled with cheesy material that is easily expressed. Rarely a single lesion will grow as large as 3 cm in diameter (a so-called giant molluscum). Lesions may be single, but more typically are multiple (less than 50) because of the autoinoculable nature of the infection. Lesions may occur in the periocular region and, if found on the eyelid margin, may produce a follicular conjunctival reaction. Other ocular manifestations include epithelial keratitis, pannus formation, conjunctival scarring, and punctal occlusion. Primary conjunctival or limbal lesions may rarely occur. Patients who have acquired immunodeficiency syndrome often have an atypical presentation of molluscum contagiosum. Disseminated disease may be present and lesions are often more confluent. Such patients may have 30 to 40 lesions on each eyelid. HISTOPATHOLOGY Lesions of molluscum contagiosum consist of inverted lobules of hyperplastic epidermis expanding into the underlying dermis. Fine septa of dermis separate lobules. Infected keratinocytes have eosinophilic inclusions that occupy almost the entire cell. 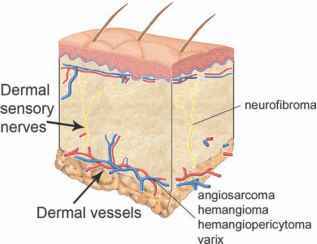 The inclusion bodies begin to form in keratinocytes just above the basal layer, and they progressively enlarge towards the epidermal surface. The inclusions may become basophilic near the skin surface. The viral inclusion bodies (molluscum bodies) and keratinous debris are extruded into dilated ostia leading to the skin surface. DIFFERENTIAL DIAGNOSIS The differential diagnosis includes intradermal nevus, verruca vulgaris, milia, syringoma, keratoacanthoma, sarcoid, trichoepithelioma, and basal cell carcinoma. TREATMENT Molluscum may frequently resolve spontaneously in immunocompetent hosts within 3 to 12 months. However, some form of treatment is generally required to prevent corneal complications, reduce transmission, and speed recovery. Various treatment options are available including simple unroofing and curettage, chemical cautery with trichloractetic acid, cryosurgery, and electrodessication. Treatment is more difficult in AIDS patients because of extensive involvement and recurrences. Hyperfocal cryotherapy may be effective in this setting.